Use to evaluate posture. The plastic posture grid (25" x 48") can be suspended from the ceiling or wall bracket. Set includes a suspension cord and a plumb bob to measure alignment. 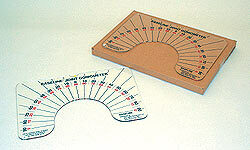 The posture grid and posture evaluator can be used together or separately to measure and record posture. The three piece set including the posture evaluator, posture grid and arthrodial protractor is all you may need to perform complete posture evaluations and range-of-motion measurements. Measure range-of-motion for all major articulations, cervical rotation, lateral flexion of the head and anterior-posterior cervical flexion. Bubble level assures measurement on horizontal plane. Two 180° opposing scales in 5° increments. Measurements can detect scoliosis and abnormal anteropostero curve. Also measures the unstable lumbocacral, cervical and thoracic curves. Centimeters, inches and degrees.